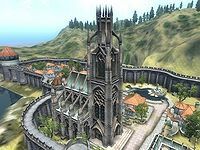 Chapel of Dibella is in Anvil's Chapelgate district, next to the gate to Castle Anvil and across from the town's graveyard. This chapel specializes in Luck and Personality. The building is divided into the Chapel of Dibella, the Chapel Hall, and the Chapel Undercroft. 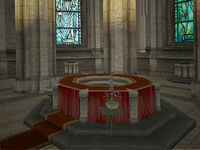 When the Knights of the Nine plug-in is installed, the chapel is attacked. The changes are noted below, including the NPCs that replace two of the three dead residents. All three front doors open into an entrance only two steps elevated above the main room ahead. A staircase here leads below the front doors where two doors on the west wall lead into the undercroft and a door on the east wall leads into the chapel hall. The cathedral altar at the end of the room holds a sample of viper's bugloss and a sample of blue flax on a pedestal on each side. Nine altars to each of the Nine Divines line the walls around this room. To the right of the door to the Chapel Hall can be found two barrels containing food. The door on the north wall leads into a bedroom with a single bed on the east wall and another on the west wall. The desk on the north wall contains clutter and possibly a common book. The door on the south wall of the main entrance room reveals a room with a table on the south wall that seats four. On it sit three apples, three blackberries, a loaf of bread, two carrots, two cheese wedges, two oranges, two pumpkins, three strawberries, a sweetroll, three tomatoes, a bottle of Tamika's West Weald Wine, and a bottle of Surilie Brothers Wine. In the northeast corner two barrels sit side-by-side and contain food, as do the two sacks in the floor next to them. The two barrels on the west wall both contain food, as do the three untied sacks in the floor next to them. The tied sack on the floor next to the other barrel contains clutter, as does the one on top of the wine racks on this wall. The racks hold 19 bottles of cheap wine. The stairs in the southeast corner of the main entrance room lead down into Trevaia's bedroom. Her bed is in the northeast corner, and the chest next to it contains clutter. A bottle of Surilie Brothers Wine sits on top of it. The desk on the south wall contains clutter and possibly a common book, and on top of it sits a sweetcake. The cupboard next to it contains clothing. The stairs in the northeast corner of the main entrance room lead down into Laralthir's bedroom. Her bed is in the southeast corner, and the chest next to it contains clutter. The desk on the north wall contains clutter, and the cupboard on the west wall contains clothing. The door on the east wall of the main entrance room reveals Dumania Jirich's bedroom. Her double bed is by the east wall. The desk in the northwest corner contains clutter and possibly a common book, and on top of it sit two apples and a copy of the skill book 2920, Frostfall. The chest next to it contains clutter. The chest of drawers on the south wall contains clutter, and two bottles of Tamika's West Weald Wine sit on top. The chest next to it contains gold and possibly jewelry and clutter, and the cupboard on the other side of it contains clothing. This last chest is the only container in the chapel hall that does not respawn other than sacks, and so all others are unsafe for long-term storage. In the main room a skeleton lies next to the drain in the middle of the floor. The stairs at the west end of the room lead down into a small tomb with two funereal statues. The stairs in the northeast corner of the room lead down into another small tomb, this one with a single funereal statue. The stairs in the southeast corner lead into a mirror image of the previous room, this one with a skeleton in the floor and a small non-respawning chest on the ledge. When Knights of the Nine is installed, large splotches of blood are on the floor in front of the front door. A pew is overturned at the head of the stairs, and the rest are in disarray. Laralthir's body lies on the floor next to the pews, and a hanging light has fallen to the floor next to her. One of the pedestals at the main altar has been knocked over, and the viper's bugloss and flax lie on the ground. Dumania Jirich's body is lying in the middle of the altar. The Ayleid runes written in blood on the floor around the altar read "As oiobala Umarile, Ehlnada racuvar" which The Prophet will tell you is Ayleid for "By the eternal power of Umaril, the mortal gods shall be cast down". The curtain between the stained glass panels of Stendarr and Talos is burning on the ground, and the one above Stendarr is knocked askew. The altar of Dibella in the southwest corner is burning, and Trevaia's body is on the floor here, as well as another hanging light. Selene Duronia, a "replacement" for Trevaia, can be found here after the Knights of the Nine questline is completed, and in the Chapel Hall Amragor can be found in what was Laralthir's bedroom. Her bed is now available for any member of the Nine Divines faction to use, as are the beds in what were Dumania Jirich's and Trevaia's bedrooms. If the player disables the Knights of the Nine plugin and starts a new game, the priests inside the Chapel may not be enabled and thus the Chapel will be permanently empty. The only way to fix this is with console commands or by reinstalling the Knights of the Nine plugin. This page was last modified on 8 July 2018, at 14:23.